Why not allow yourself the luxury and comforts found inside and outside of the Winnebago Aspect class C gas motorhome. Beginning with the Ford E450 chassis, premium high-gloss skin, large rear exterior storage compartment with drain plug and folding table, to the swivel cab seats, home theater sound system, and polished Corian countertops, you might never want to return home! Come see why the Winnebago Aspect class C gas coach continues to be at the head of its class! Looking to travel the countryside with your spouse and maybe a few friends? Just imagine driving down the road in comfortable cab seats with fixed lumbar support while your guests ride on the BenchMark dinette seats that include four seatbelts. They may decide to play a card game or eat a meal as well. Once at your destination, you can retire to the rear semi-private bedroom with a folding door, a queen bed, and storage for your things. The full bathroom will come in handy no matter where you are. You can enjoy two TVs when inside, one in the main living area and one in the bedroom. Take a look at this Aspect class C gas coach today! With any Aspect class C gas coach by Winnebago you might just change your perspective about traveling once you step inside. From the cab seats that swivel/recline/slide to the lounge area providing more seating, the USB/multi-outlet charging stations to keep the electronics charged, the microwave/convection oven, and Radio/Rearview monitor system you will not miss a beat going or coming. There are other features you will appreciate such as the SuperStructure process creating a strong and durable cab substructure, the TrueLevel holding tank monitoring system providing accurate tank readings, and more! Choose your favorite model and lead the way to adventure and comfort! Basement Storage 93 cu. ft. Imagine driving to see extended family in comfortable cab seats with fixed lumbar support while your kids ride on the BenchMark dinette seats that include three seatbelts and the Flexsteel Fold-N-Tumble with two seatbelts. Once you arrive to your destination, everyone can make meals and eat together with seating for eight people. When it’s bedtime, just walk towards the rear to a split bathroom to sleep on a queen bed in a semi-private bedroom with a folding door. The furniture provides extra sleeping space as well. You will find storage throughout including along the exterior. Step inside this Aspect class C gas coach today! Basement Storage 102 cu. ft.
See our Aspect inventory here. Recently, we covered the Winnebago Travato 59GL and 59KL with the Pure3 Energy Management System in our live interactive webcast. We collected the top questions we received in that webcast. You can WATCH OUR WEBCAST HERE on the Winnebago Travato 59GL and 59KL. We also covered the 2019 model year changes in the 59G and 59K and introduced the Pure3 Energy Management System in a webcast earlier this year – WATCH IT HERE. What is the difference in operation between the Pure3 system vs. the Coachmen lithium system? The Pure3 system is considerably easier to operate – it is a one button operation that is run off one inverter. The coachmen has several different gauges to operate the system. Read our blog post on the Pure3 Energy Management vs. the Coachmen Galleria lithium system here. Does the inverter need to be on to run 12-V appliances in the Travato 59KL and 59GL? No the inverter does not need to be on. The inverter is only required to be on when you are wanting to power 120-volt electronics, like the air conditioner, without shore power. How do you charge the Pure3 System in the Travato 59KL and 59GL? Underhood generator – The Pure3 Energy Pack can also be charged through the underhood generator or second alternator. The Travato’s dedicated 58-volt alternator is twice as powerful as the competitors. Its compact design keeps it out of the way of curbs and road debris. It also allows you to completely recharge your battery in approximately 1.4 hours allowing you to get back on the road and off-the-grid. Shoreline – Like other RVs, the Pure3 Energy Pack can be charged off shoreline power or when it is hooked up to power at a campsite. However, unlike most other RVs, the Travato 59KL and 59GL are equipped with a 3600-watt pure sine wave inverter bringing 30 amps of power wherever you go. Solar Package – The Pure3 Energy Pack can be charged by the solar power system. The Travato 59KL and 59GL’s MPPT solar controller provides best-in-class solar absorption, up to 30% better than competitors, giving you more off-the-grid performance. The Travato comes standard with 200-watts with ports to plug in additional panels. What mode charges the Travato 59KL and 59GL the fastest? The underhood generator. The Travato’s dedicated 58-volt alternator, or under hood generator, is twice as powerful as competitors. Its compact design keeps it out of the way of curbs and road debris and the auto-start and high-idle control significantly extends air conditioner run time. How long can you run the AC off the Pure3? 6-8 hours if you are running several systems like the refrigerator and the Truma Combi at the same time. What are the considerations for cold weather operation? Fan will turn on at 59°F (Heat Mode) or 110°F (Cool Mode). Fan will turn off at 68°F (Heat Mode) or 90°F (Cool Mode). What is the lifespan of the batteries? The expected useful life of the batteries is 10 years and they are covered by an industry-leading 8 year warranty. Is the vehicle a true 4 season RV? Has Winnebago road tested the Travato 59KL and 59GL? Absolutely. There is an employee at Winnebago that has put on over 10,000 miles and has yet to charge the system with shore power. Winnebago also tested the location of the underhood generator to ensure users don’t have issues with ground clearance causing damage to the underhood generator. Currently, Lichtsinn RV has in-stock 2019 Travato 59K, 59G, 59KL and 59GL models. You can see our Travato inventory here. For more information on this product, please call 1-800-343-6255 and speak with one of our Winnebago Factory Trained Sales Consultants. For more than six decades, Winnebago Industries has created products that enable customers to explore America’s national parks. Winnebago Industries, Inc., a leading outdoor lifestyle product manufacturer, strengthened that connection by announcing a multi-year partnership with the National Park Foundation (NPF), the official nonprofit partner of the National Park Service, in support of the Find Your Park Movement. This public awareness campaign inspires people of all backgrounds and abilities to discover and share their own unique connections to America’s national parks. To launch the partnership, Winnebago is proud to announce the debut of a limited-edition National Park Foundation Travato revealed for the first time at RVX: The RV Experience, a recreation vehicle industry trade show in Salt Lake City, Utah. The design teams at Winnebago created a new Travato design, inspired by the National Park Foundation, featuring exclusive graphics and the Pure3 Energy Management System that has a larger lithium battery pack than the traditional Travato KL and GL with the Pure3 Energy Management System offering users 11,600 watt-hours of power. The Travato also has upgraded wheels and tires to allow you to get off the beaten path, the popular Ram Mounts (similar to those featured in the Winnebago Revel) and Sumo Springs, a popular aftermarket addition to Travatos, all are now standard features. The National Park Travato now has a new air conditioner that is up to 8 decibels quieter than previous models, which will come in handy in National Parks that have noise and generator ordinances. Following RVX, James and Stef Adinaro of the Fit RV, will travel in a new limited-edition National Park Foundation Travato to share stories from the road. 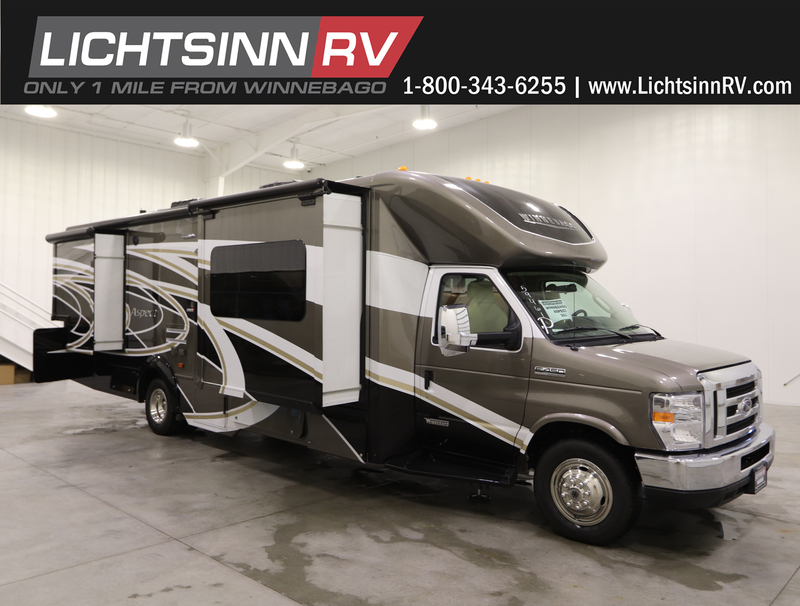 For more information on this floorplan, please call 1-800-343-6255 and speak with one of our Winnebago Factory Trained Sales Consultants. In the spirit of March Madness, we at Lichtsinn RV will be comparing various Winnebago motorhome models. The first in our March Motorhome Madness is the Travato versus Revel. Both the Travato and the Revel have off-grid capabilities and are small and agile Class B motorhomes. Based on the powerful, fuel efficient ProMaster chassis, the Travato has been at the forefront of the van life revolution since its launch. Estimated to achieve 18 to 22 mpg highway, at only 21 feet long the Travato offers all of the comforts of home in a nimble, efficient van. 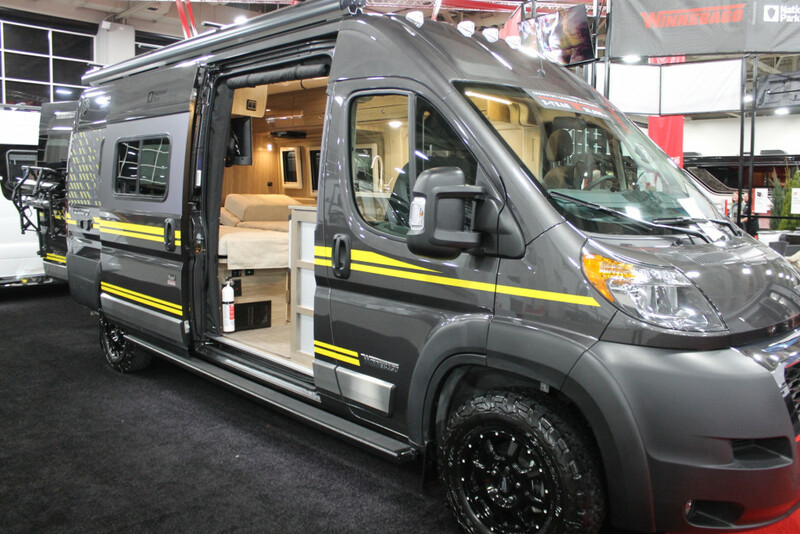 The Winnebago Travato comes in four floorplans – the 59G, 59K, 59GL, and 59KL. Based on the powerful, fuel-efficient Ram ProMaster chassis, the Travato has been at the forefront of the camper van revolution since its launch in 2014. Thanks to premium features such as the energy-saving Truma Combi eco plus heating, the Deluxe FROLI sleeping system and Corian countertops, the new Travato is better than ever. With significantly upgraded standard features like 200-watt solar panels and new interior décor colorways, alongside several options, you can tailor the Travato to suit your needs. The Travato 59K and 59KL feature swiveling cab seats that become an integral part of the living and dining space, two twin beds that convert into cross-coach sleeping, and a spacious rear bath with wardrobe. The Winnebago Travato 59K and 59KL are 21 feet long, with an interior height of 6 ft. 3 in., and holding tank capacities of 13 gal. (black) in the 59K and 12 gal. (black) in the 59KL and 13 gal. (gray) in both the 59K and 59KL. The Travato 59G and 59GL feature a spacious corner bed and corner wet bath, swiveling cab chairs that join the dinette to form a seating area for up to four. The Winnebago Travato 59G and 59GLhave seating and sleeping for up to four compared to the 59K and 59KL that have sleeping and seating for two. And now, the Travato also offers the most powerful, durable and easy-to-use lithium energy system in the RV industry. The Pure3 Energy Management System comes standard in the Travato 59GL and 59KL. This best-in-class system is U.S. built in partnership with Volta Power Systems, helping RVers “cut the cord.” Pure3 is built with advanced engineering and a simple user interface so you can have confidence and peace of mind as you travel down the road. The 48V automotive-grade lithium energy storage pack provides up to 8,700-watt hours of energy, and powers all coach appliances. Designed for reliability, the Pure3 system makes replenishing power fast, simple, and available through multiple charging options. The 58V alternator, although compact in size, packs a punch and quickly charges the pack as you drive. Pulling off for the night is stress-free with this advanced lithium system that meets all your power needs without requiring power hookups or the use of a generator. This fully integrated system includes a powerful 3,600-watt pure sine inverter that offers 30 amps. of power at any time, powering air conditioning and appliances wherever you go. The best part of this hassle-free system is that it operates on the push of a button and a simple analog gauge that tells you how much energy remains. With the same automotive-grade technology used in hybrid vehicles and EV applications, this newly advanced lithium energy system provides better value, ease of use, and confidence as you travel, live, work, and play. Lichtsinn RV has a collection of videos and blogs about the Winnebago Travato. See our Travato Tales page featuring our videos, blogs and more here. You can also sign up for our monthly Travato Tales email newsletter here. The true 4×4 RV opens up a world of possibilities! Now with enhanced safety features from Mercedes Benz including blind spot monitoring, collision prevention assist, lane keeping assist and much more! 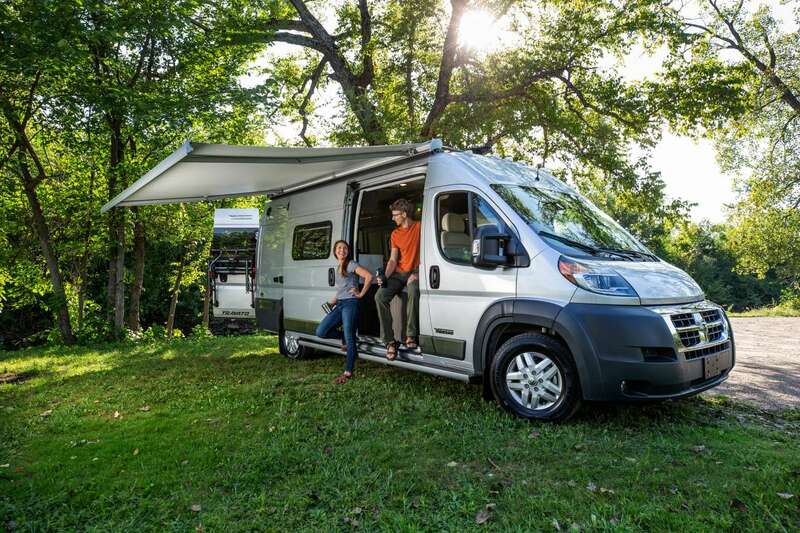 Designed specifically for active outdoor enthusiasts, the all new Winnebago Revel takes a no nonsense approach to adventure with a straightforward design and function-driven features. Taking full advantage of the proven 4×4 Mercedes-Benz Sprinter chassis, the Revel’s 3.0 litre turbo diesel puts 325 lbs ft of torque through an on-demand 4WD system, complete with high and low range and hill descent mode for added off road capability. 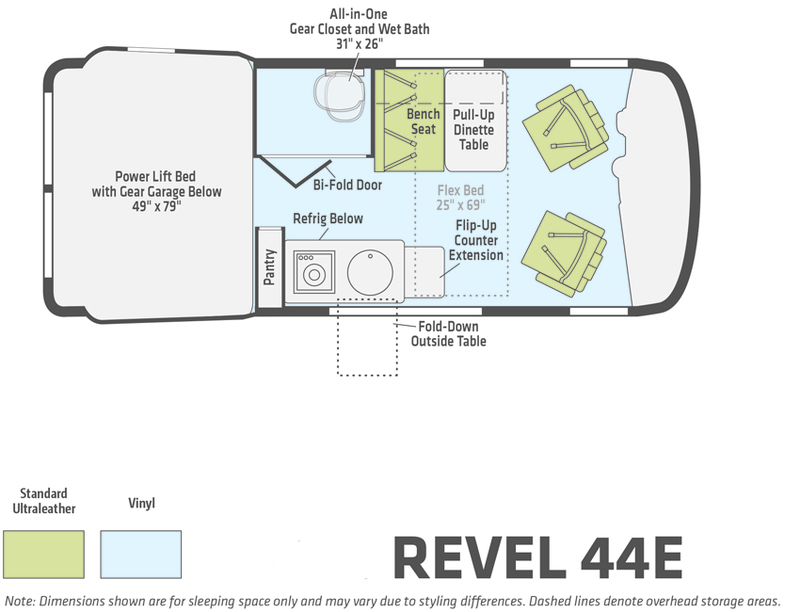 Inside, the Revel’s unique features start with a floorplan designed around a Power Lift Bed with a 140 cu. ft. gear garage below. This allows for a 49 x 79 inch cross coach sleeping area. A full galley, including a 2.5 cu. ft. refrigerator, makes meal prep a breeze, while the all in one bath and gear closet boasts a cassette style toilet that eliminates the need for a separate black water holding tank. 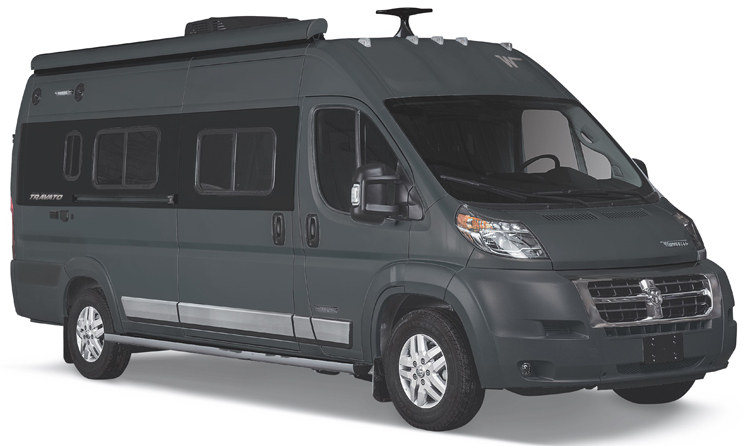 Add a standard solar power system that is expandable to 510 watts, diesel powered heating, a dinette with a pull-up table that converts to additional sleeping space, and many more innovative features and the result is the new Revel: quite simply the most off road capable RV Winnebago has ever built. Storage and living space are maximized by the flared body and Power Lift Bed that converts to a 49 x 79 inch sleeping surface. Welded aluminum cabinet face frames, dual pane windows with insulated shades, snap in screens for fresh air circulation, and an available roof mounted AC system all contribute to the Revel’s off the grid livability. Better energy systems are the next wave in RVs. More owners want their AC and other appliances to run longer—long enough to keep pets cool for hours, and still provide hot showers while running other appliances. But they also want to untether from campground outlets and avoid noisy generators that compete with the sounds of nature. That’s why there’s a buzz around lithium ion batteries—the kind that power electric and hybrid cars. Traditional lead-acid batteries like to be charged relatively slowly compared with lithium ions. The faster charge rate combined with much greater capacity for their weight is what makes lithium ions a true game-changer. A few RV “techies” are installing their own systems and posting DIY instructions online. But if you’re not that much of an engineer, you’ll be happy to know a few RVs now come with optional lithium batteries built-in. At Winnebago, we’ve started with one of our most popular B vans, the Travato, introducing the Pure3 Energy Management System in our 2019 Travato 59GL and 59KL. (See video here.) These two models are fully engineered around the most advanced energy system available (see comparison chart). Think of power as three traits: charging speed, battery capacity, and how long the charge lasts. Most new RV lithium cells, including the do-it-yourself kind, are just 12 volts—a size that typically requires a long charge time and quickly depletes. If you want a rapid charge or several more hours of reliable juice, look for a more robust system, like the 48-volt Pure3. The Winnebago system recharges from either a conventional outlet or a dedicated 58V alternator hooked up to the engine and a solar panel on the roof helps maintain the charge. During a charge cycle—whether manually initiated or requested by the battery—the Travato’s engine starts and ramps up to 1600 rpms, dramatically reducing recharge time compared with conventional batteries or smaller lithiums. You’ll quickly have 30 amps of 110v power for heating, cooking, or air conditioning. Fewer RV owners are parking near a hook-up station for very long. They’re blazing out to the trailhead, exploring a National Park, or dry camping at an outdoor music festival. If this sounds like you, you need a system that restores battery power while you run the engine. Even short trips will do it. And when you’re parked, the Travato 59GL and 59KL have an auto-start feature that starts the engine to recharge the battery. This feature extends the run time of the air conditioner beyond the battery’s fixed capacity. It’s a convenience that provides extra peace of mind when you’re gone from the RV for an extended period of time—for example, when you leave your pets for an evening out to dinner. Ease of use includes keeping tabs on available energy. You shouldn’t have to scratch your head over the readout on a voltage indicator. The Pure3 system has a simple analog gauge that lets you know when it’s running low—like the gas gauge on your car. Look for a battery that’s built to last. The best value and least hassle will be one that’s automotive-grade like the Pure3. You’d generally expect to replace a common lead-acid battery several times over the life of your RV, but the Pure3 is built to work as long as the Travato does, just like batteries in electric cars. To get a unit this durable, Winnebago worked with Volta, the leading name in vehicle energy systems. Protection from the elements contributes to long life. For that, we mounted the Pure3 below the coach and inside a water-resistant, insulated steel housing. Cabin air circulates around the compartment when the weather gets too hot or cold. And the whole system is compact to provide ample clearance, even on rutty roads. Beyond tech specs, the key test is lifestyle. Will it enable the uncomplicated RV life you want? Our goal with the Travato 59GL and 59KL was to take lithium technology out of the realm of geek-dom and put it in the hands of the everyday RVer. 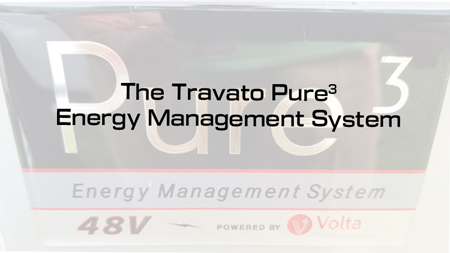 For $20,000 above the Travato’s regular MSRP, the advanced Pure3 energy system is a practical solution when you average its cost and comforts over the entire life of your RV. We’re pretty sure lithium ion systems are going mainstream in the not-too-distant future. So, when it comes time to shop around, look under the hood—or, in Winnebago’s case, under the coach. Make sure the energy system you choose has the capacity, durability, and simplicity you need for truly carefree adventures. Post originally appeared on RVT.com. Lichtsinn RV, America’s closest dealer to Winnebago Industries, has been named Top North American Winnebago Dealer by Winnebago Industries for the last four consecutive years. We proudly sell New RVs manufactured by Winnebago Industries as well as Used RVs. See our Winnebago Travato inventory here. Winnebago released a lithium-powered version of the Travato available in the 59GL and 59KL floorplans. The Winnebago Travato 59KL and 59GL floorplans are equipped with the Pure3 Energy Management System the most powerful, durable and easy-to-use lithium energy system in the industry. This best-in-class system is built in the U.S.A in partnership with Volta Power Systems. 200W with ports to plug in additional panels. wiring harness to ensure trouble-free operations. design keeps it out of the way of curbs and road debris. energy is remaining with just a glance. Call the Lichtsinn RV Sales Department at 1-800-343-6255 to find out more about the Pure3 Energy Management System and Pure3 Powered Travatos In-Stock. The Winnebago Travato 59KL and 59GL are equipped with the Pure3 Energy Management System featuring the most powerful, durable and easy-to-use lithium energy system in the industry. This best-in-class system is built in the U.S.A in partnership with Volta Power Systems. Pure3 is built with advanced engineering and a simple user interface so you can have confidence and peace of mind as you travel down the road. Designed for reliability, the Pure3 system makes replenishing power fast, simple, and available through multiple charging options. In mild and extreme conditions the Pure3 Energy System can meet all of your power needs without requiring power hookups or the use of a generator. Note that if High Temperature Limit is reached, the pack must cool to 126°F before discharge can continue. If High Temperature Limit is reached, the pack must cool to 109°F before charging will resume. If Low Temperature Limit is reached, the pack must heat to 43°F before charging will resume. 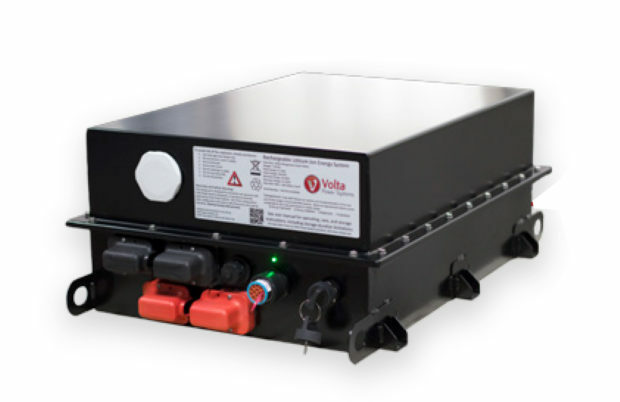 As with any storage system, like batteries, fuel or water tank, preparations should be made to protect the life and performance of the Volta Power Systems Pure3 lithium power system when not in use. Charge the Volta Power Systems Pure3 lithium energy storage system to greater than 50% SOC as indicated on the SOC gauge in the vehicle. Turn OFF all vehicle electrical features powered by the Volta Power Systems Pure3 lithium system. This includes DC and AC electrical features in the vehicle as well as the inverter/charger by their control switch or display. With the vehicle engine off and the shoreline unplugged, press the Volta Power Systems Pure3 lithium energy storage pack ON/OFF button. When you turn the button off, the green light on the button may stay on for a period of time while the system shuts down all components. This can last up to a couple minutes. The gauge may blink blue momentarily during this time. You will know the pack is properly shut down when the lights on the button and gauge are completely off. At this time power should no longer be available from the system. The Volta Power Systems Pure3 lithium energy storage pack is now deactivated and the power distribution devices are off. To find out more about the Winnebago Travato Volta Power Systems Pure3 Lithium Energy System call us today – 1-800-343-6255, or Click on THIS LINK. Based on the powerful, fuel efficient ProMaster chassis, the Travato has been at the forefront of the van life revolution since its launch. Estimated to achieve 18 to 22 mpg highway, at only 21 feet long the Travato offers all of the comforts of home in a nimble, efficient van. The Pure 3 Volta Power Systems automotive grade 48V energy pack provides 8,700 watt hours, nearly double that of Roadtrek and more than Coachmen. The energy pack is watertight, durable with the steel housing being the safest on the market, and batteries are climate controlled. One question we often get is if the ground clearance has changed in the Travato 59KL and 59GL with the lithium system. The answer is no, the ground clearance remains the same at 7.25-inches to 7.5-inches in the 59KL and 59GL as the 59K and 59G. WATCH OUR VIDEO ON THE TRAVATO 59KL AND 59GL GROUND CLEARANCE AND CLIMATE CONTROL HERE. 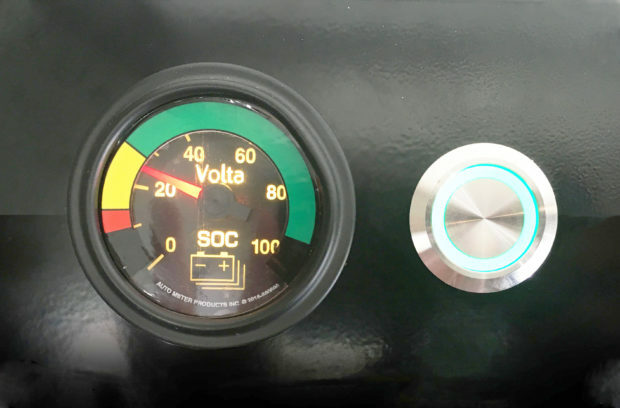 The main difference between the Travato 59K and 59G and their lithium-powered counterparts is the climate controlled box that houses the Pure3 Energy Management System automotive grade 48V energy pack from Volta Power Systems. The climate controlled box is mounted between the two rear wheels and is protected from road debris in a watertight and durable steel housing that is the safest on the market. The energy pack’s steel housing is also heated from the Truma Combi Eco Plus heating system. Most RVs come with an inverter standard. The Winnebago Travato 59K and 59G come with a 1,000-watt pure sine wave inverter that provides clean 110-v electricity to select outlets to allow you to safely power personal electronics like computers and cell phones. By contrast, the Winnebago Travato 59KL and 59GL has a 3,600-watt pure sine wave inverter that provides complete 110-volt and 30-amp coach power directly off the Pure3 Energy Management Power pack. The Pure3 Energy Pack can be charged by the solar power system. The Travato 59KL and 59GL’s MPPT solar controller provides best-in-class solar absorption, up to 30% better than competitors, giving you more off-the-grid performance. The Travato comes standard with 200-watts with ports to plug in additional panels. Like other RVs, the Pure3 Energy Pack can be charged off shoreline power or when it is hooked up to power at a campsite. However, unlike most other RVs, the Travato 59KL and 59GL are equipped with a 3600-watt pure sine wave inverter bringing 30 amps of power wherever you go. The Pure3 Energy Pack can also be charged through the underhood generator or second alternator. The Travato’s dedicated 58-volt alternator is twice as powerful as the competitors. Its compact design keeps it out of the way of curbs and road debris. It also allows you to completely recharge your battery in approximately 1.4 hours allowing you to get back on the road and off-the-grid.